The annual engineering stakeholders dinner to celebrate the engineering department and the philanthropists that fund its advancement. A University of Florida department of industrial engineering alumnus has endowed three scholarships for distribution beginning spring 2018. One will be awarded through the Herbert Wertheim College of Engineering, while the other two will be affiliated specifically with ISE. The scholarships were endowed by Carlos del Sol, ’72, a member of the ISE Hall of Fame and a University of Florida Distinguished Alumnus. “My wife and I are very much committed to the College of Engineering,” del Sol said. As the scholarships will not begin for another year, del Sol has donated an additional $1,500 to award two scholarships this semester. “As a graduate of industrial engineering, I am very committed to the department,” del Sol said. After graduating from UF, del Sol worked for General Electric for 15 years in a variety of manufacturing and supply chain assignments. Afterward, he went on to work for the Campbell Soup Company, where he retired after 23 years as vice president of the Global Engineering Team. Del Sol came to the United States from Cuba in the 1960s as a refugee through Operation Peter Pan. The program helped 14,000 Cuban children seek asylum from Fidel’s Castro’s burgeoning communist regime. He was only able to afford the cost of attending college with the help of scholarships and a loan. It sparked a commitment to “pay-it-forward” that characterized his professional career. 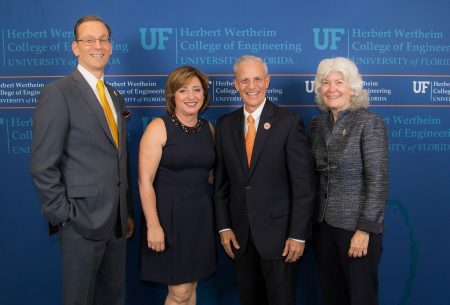 He served as a trustee of the United Way of Camden County, N.J., was vice chair of the Campbell Soup Foundation and has supported UF’s STEPUP– a program that helps first-year minority engineering students transition to college. “I’d always felt that someone had helped me, and I wanted to help other people as well,” del Sol said. In addition to helping unrepresented groups make space for themselves in engineering, del Sol is also passionate about inspiring students to take charge. He is especially interested in encouraging students to pursue his particular field of supply chain and manufacturing. One of the scholarships is designated specifically for an undergraduate student interested in supply chain and manufacturing. “Whenever I have the opportunity to present to students, I always talk [about how] one of the rules for success is, you always have to give back to the community and to the University of Florida,” del Sol said.